I found the perfect group of neighbors to work with in this, my first community art project. 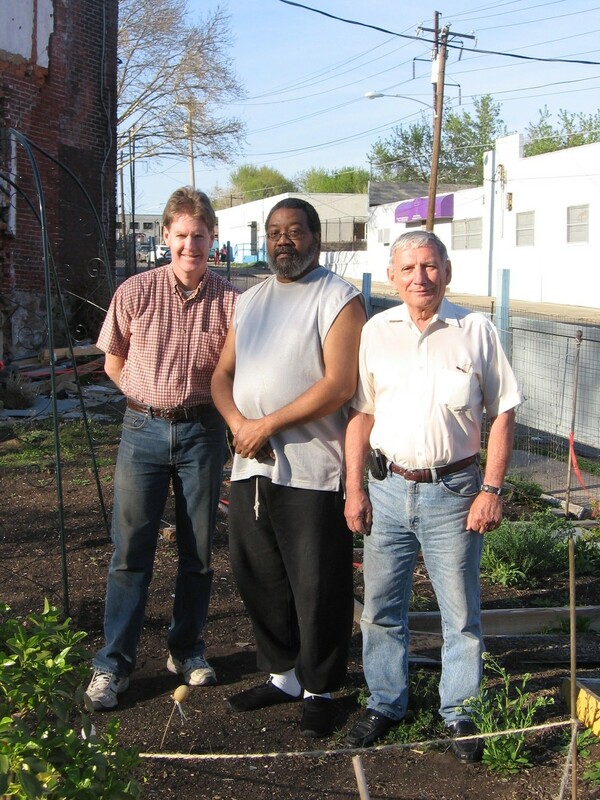 The Hunting Park Community Garden was initiated by three community leaders: Andy ( Community Garden), Jeff (Block Captain), and Luis (Block Member). These men motivated the block to clean and green this vacant lot and worked together to maintain their raised-bed vegetable and flower garden. The garden was a center of community celebration. Those involved were motivated--and familiar with working together to improve their block. I surveyed neighbors, who wanted images of vegetables and flowers. The morning of the project, I arrived early to sketch out a design but was greeted by the youth from the block eager to get started. I then realized an essential element of community art: This is their wall; let them design it. Once given the opportunity and some sketch paper, youth confidently went to the wall with their paintbrushes making beautiful, bold strokes without hesitation. They created a sense of ownership for the youth on this block, who became the hosts inviting in outsiders to participate. My biggest challenge was to truly engage everyone who came to participate while maintaining an overall level of quality to the work. Once we got busy tiling the wall, I enjoyed seeing people working creatively together while deep in conversation. The work facilitates a creative space where our hands are busy (engaging the puzzle-solving part of our brain as we place each piece of tesserae), leaving open space for our thoughts to roam or for conversation. The grout process (my favorite step in mosaic creation), mirrors the deeper social transformation that happens during relational art-making. Grout pulls everything into relationship with what surrounds it. Each piece is pulled together to play a role in a bigger, more complex, beautiful image. Grout is also a leveling agent. It fills the gaps between tesserae with varying depths, bringing the edges to meet while cementing and securing each piece in its place. Every piece takes its place in the whole. 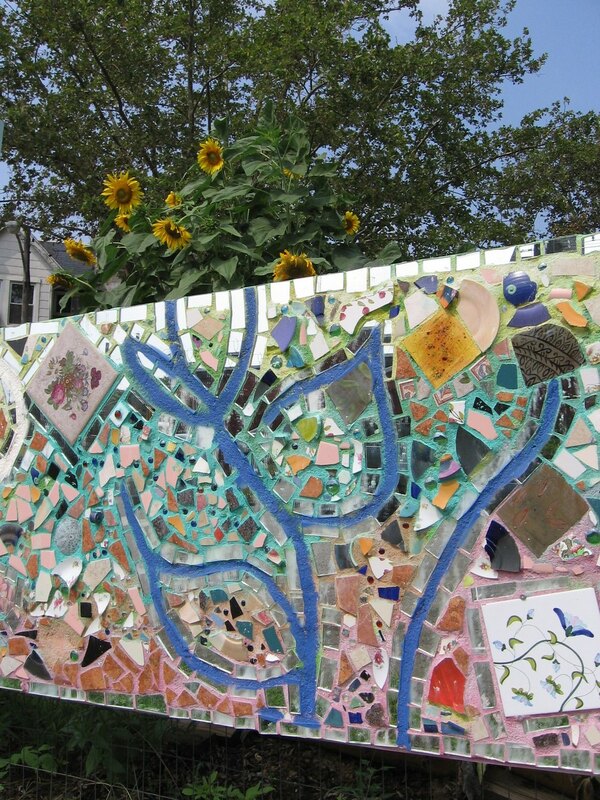 The process of “feathering,” which I learned from Isaiah Zagar, provides another metaphor for creative work with groups. After the grout is slathered on and slightly set, we use gloved hands to brush over the partially dried grout. We discover edges that are hidden in a treasure hunt that rediscovers the uniqueness of each placed tile and reestablishes its presence as a part of the whole. Like each piece of tesserae, each participant in the project has a contribution that must establish its place, be validated, and is essential for the beauty of the greater, collective work to emerge.